In order to properly plan your estate, you need to know the difference between a will and a living trust. A living trust will let you move your assets into a trust while you’re still alive, including personal property like vehicles, stocks, bonds, and jewelry. A living trust will list beneficiaries and how assets will be distributed to them after you die. How is a Will Similar to a Living Trust? These estate planning options are similar in two ways. First, you can modify both wills and living trusts when you want to. You are able to remove or add assets over the years, and even modify the beneficiaries to determine who receives which items. Second, a living trust will require an assigned trustee who will have similar responsibilities to the executor of a will. The trustee will distribute assets after your death and can even manage the living trust if you end up incapacitated. For example, a living trust will give the trustee access to money to help pay your bills if you’re unable to pay them yourself. Should You Choose a Living Trust or a Will? You will never personally see the differences between a will and a living trust because the effects will mostly take place after your death. However, that doesn’t mean that the outcome of these two options won’t matter to you. If you choose a will, it will be filed with a probate court after you pass on, which means that the people you want to give your property to may have to wait to receive the assets you assign them, depending on how complex the probate process is for your estate. Additionally, wills eventually become public record, allowing anybody to access the document to see what you left behind to beneficiaries. If you want privacy about your estate, a will may not be the best option. Living trusts allow asset distribution to happen immediately since there will not be a probate process. All asset distribution will remain private, and others will not be able to see what was in your estate when you passed. However, living trusts tend to be more expensive, and because you have to move assets into them before you die, they require more active management. In the end, your personal circumstances determine whether a living trust or a will is the best choice for you. Have an expert talk to you about the benefits and drawbacks of both options so you can make an informed decision. Not having an estate plan in place is a serious national problem, since over half of the adults in the US don’t have one in place. Know what can happen if you decide to not do anything regarding your estate. Who Will Be in Charge of the Estate? The court starts by selecting a surviving spouse or adult child to be the executor of the estate, and if those people aren’t available, and the court moves on to other relatives. This court-appointed person will be in charge of dividing your assets. How Will Inheritance Be Determined? Every state has their own succession laws that determine who will receive your assets after you pass away. Generally, a surviving spouse and blood relatives having a rightful claim. Friends and partners that are not married will not be able to make a claim to any assets, and would depend on your family members to redistribute assets to them. If you do not have surviving blood relatives, your assets will go to the state. 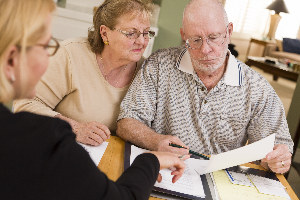 Now that you understand more about estate planning, it is time to make your own plan. Work with the Ivy Law Group PLLC to find the best option for you.